A modern, spacious, 5 bedroomed home which is situated close to the centre of the picturesque and bustling holiday town of Portstewart. This two storey house has been completely refurbished throughout to a very high standard for 2014. The holiday home is used by the owners occasionally, so there are many special features and high quality fixtures and fittings. There are 5 bedrooms – 2 double, 2 king, and 1 single all of which are furnished with modern furnishings. A sofa bed in the 2nd living area, allows an additional 2 guests, to accommodate max 11 guests. There are 3 bathrooms – 1 family bathroom, 1 shower room and 1 en suite. 2 reception rooms furnished comfortably with leather suites and appealing wall art. 1 living area has French doors leading to the rear garden area. 2nd living room has media facilities, smart 3D plasma TV. Wooden flooing throughout bedroom and reception rooms. Entrance hall, kitchen and bathroom areas all tiled in attractive modern design. Newly fitted cream gloss kitchen, with teal glass splashback give the kitchen/ dinning area a bright, contemporary appearance. All new kitchen and electrical appliances. New, high quality tableware and food preparation equipment, complement the “home from home” holiday experience. Oak staircase, internal doors and finishings add to the modern character of this home. This very well equipped home is within walking distance of the spectacular strand beach, the golf course and Portstewart promenade. It is an ideal base for numerous types of holidays and all north coast attractions. There are beautiful beaches, water sports, quaint harbours, world renowned tourist spots, fishing and angling opportunities, fantastic golf courses, lovely walks on coastal paths, scenic train journeys, very appealing play parks, tennis courts, bowling, indoor play areas, entertainment complex in Jet centre Coleraine. There is an extensive range of local shops and neighbouring town of Coleraine, giving you the opportunity of local food produce and many unique retail stores. Various restaurants and cafes are located in the area, a wide choice of cuisine within driving distance. The local area hosts many musical, sporting, family and Christian events. 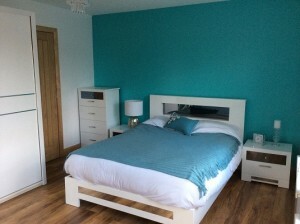 Copyright © 2019 Portstewart Holiday Homes All Rights Reserved.